Hey there... Jakob Müller here. I've never done this before. Usually my wife, Jaymie, does all the blogging. You might know her... she's kind of famous around Queensville and Wolverhampton for a lot of things, solving murders among them. You know, as much as I loved my life, it's all ten times better now that Jaymie is my wife. My little girl, Jocie, is ecstatic. But right now Jaymie is deep in another adventure, as well as having to write her food column and work on the cookbook she's writing, look after our daughter Jocie, volunteer at the historic house and the hundred and one other things she does. Maybe that's the secret to our marriage... we're both so busy we love coming together at night and having each other and that little quiet time. So she asked me to write this, about our Christmas tree farm. I started it when I was in my twenties. Farming is in my blood. Growing up us boys always worked the farm, but most of them went off to do something else, though Dieter came back to live with my folks after his divorce and still works on the family farm. I stayed and started the Christmas tree farm on some land that won't grow much else. Everyone thinks a Christmas tree farmer is only busy between Thanksgiving and Christmas, but it's a year 'round occupation. There is tilling and mulching and pulling out stumps and planting... fertilizing, choosing the trees... a hundred and one things. But it's really rewarding, too. It's all worth it to see a family drive off with the perfect tree on their car roof, the one that will sparkle through their whole season, and then come back to us to mulch. I love what I do, but I also love that quiet time between Christmas and New Years when I get to put my feet up in front of the fire and read a book with my kid, and this year, with my wife. Do you have any memories of YOUR perfect tree? Or the seasonal holiday tradition you loved the most? 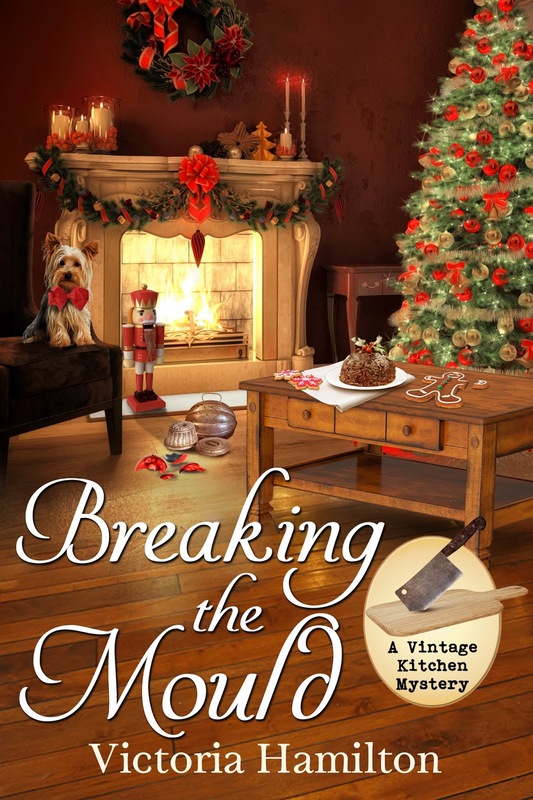 Breaking the Mould, #8 of the Vintage Kitchen Mysteries, will be coming out November 13th, just three weeks from now! Jaymie's in a festive mood for her first Christmas with her new family. But she's also busy with Queensville's annual holiday festival, Dicken Days! Will a Scroogey local dampen her spirit, or will murder once again interfere in the festivities? 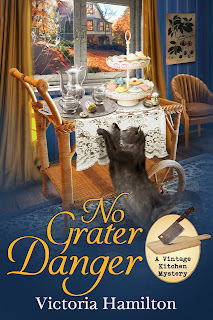 To celebrate in advance of the new release, I am giving away three (3) copies of No Grater Danger, Vintage Kitchen Mysteries #7, to celebrate!! Just answer one of Jakob's questions, leave your first name and an email address (youremail (at) yourserver (dot) com) by Midnight, October 23rd, for a chance to win one of three EBOOK copies of No Grater Danger! 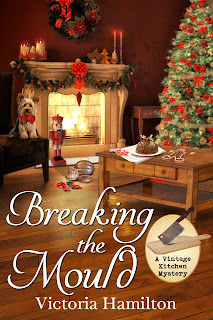 There is now a sneak peek at Breaking the Mould tucked into the end!! **Note: if you post your comment after Midnight of the 21st it will go into moderation, and I'll approve it before choosing a winner! Good Luck, everyone, and look for more fun giveaways in November!! Find me at my website, listed above, where you can sign up for my newsletter, or on Facebook and Twitter! I do have memories of the prefect tree. My cats loved it as well and climbed the tree. We had to tie it up. When I lived in Berlin, Germany for 4 years, there was a small farm I would pass by on my walks. At Christmas time,they would sell the best trees! If you bought a fairly large tree, you were always given a small one for free. I loved bringing it home on a sled! I truly miss that! 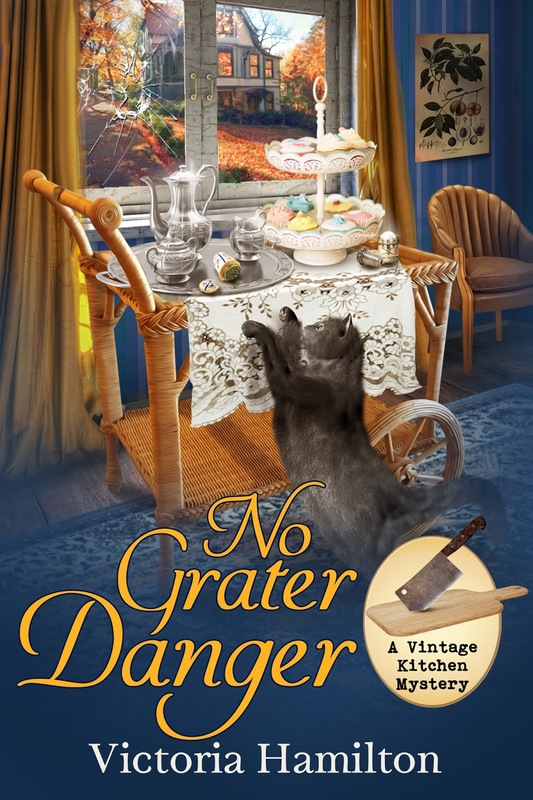 Thank you for the wonderful chance to win a copy of "No Grater Danger". My favorite Christmas memory is when my son was 3 and we bought him a pedal farm tractor. He absolutely loved it so much that he wanted to sleep with it. We had to convince him that it would be ok alone so he would go to bed. I will never forget that Christmas. Growing up we lived on 7 acres of property. We got live trees for Christmas for several years. After Christmas was over we took them out to a hole we'd dug earlier (before the ground froze too hard) and planted them. Years later I went back and looked. The trees had grown beautifully. My Dad always got us a flat backed cedar tree from the back roads-before doing so was illegal lol. Then we use to get them from a friends farm. You can't beat free even if it was flat on one side. Every time I see a cedar tree along the back roads it reminds me of my Dad and how much I miss him. I also shared the original post on FB. 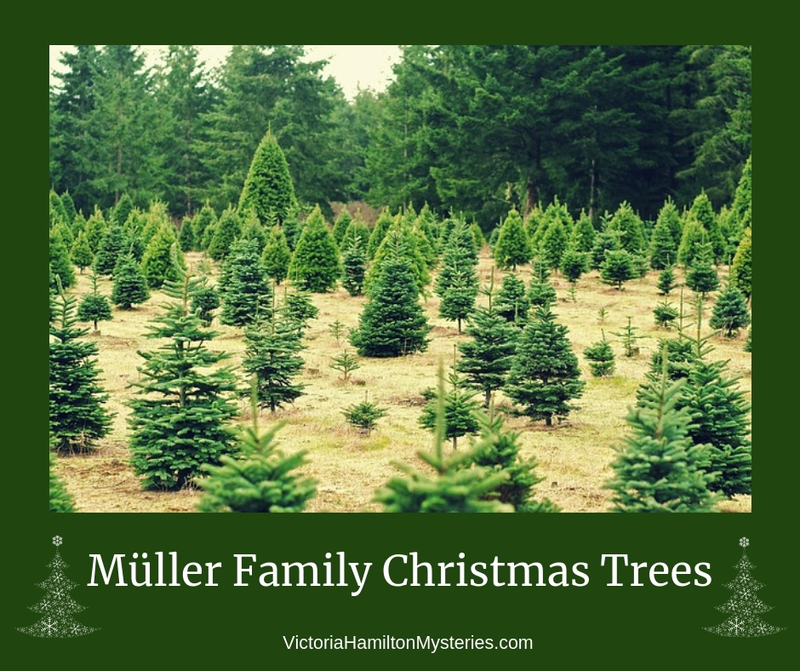 I remember our family going Christmas tree shopping and how my Dad would pull out trees to find the best and fullest tree to take home. He would always buy a Scotch Pine and we would spend the rest of the day decorating the tree. I love real Christmas trees but our daughter is allergic to them so we have to put up a fake one. I do remember haveing real trees before she was born and they made the whole house smell so good. Artificial, I am allergic to real trees. Love them too. I remember my grandfather taking me to see the Enchanted Village at Jordan Marsh - the display took over the entire seventh floor and was also featured in the window displays. Growing up, we had a silver fake tree. It had a color wheel. I had that tree until I was, perhaps, 35 when I sold it. I haven't had any tree since. My favorite tradition was going around to see all the Christmas Decorations. We don't do that very often now. One of my favorite Christmas Tree Stories was my first apt. and my Dad had bought me a huge tree. It went to the ceiling and I had decorated it to the max with every kind of bulb and sparkly icicles and snow. Reaching in the back there was something hanging and it turned out to be a note from a child in Canada wishing the person who bought this tree a Merry Christmas. It was just wonderful. Thank you for a chance at an ebook. 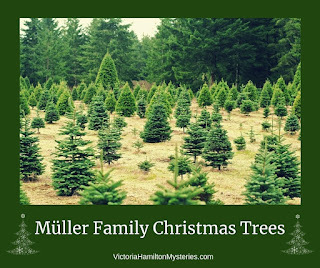 favorite memory is when all of us (six daughters) went shopping for xmas tree and they picked it out from a tree farm and we cut it down and brought home to decorate. It is still something they talk about. We celebrate Sinter Klaas on Dec 6th (when our granddaughter is visiting). Wooden shoes are placed by the door awaiting his arrival. We did this when our children were young to separate the Christian and secular Christmas celebration. I don’t have any memories of a specific tree but we always get a new ornament each year for our tree. I don't have any memories of a "perfect" tree, but I do have memories of several different trees and times. Growing up I expect we usually had real trees as I don't think artificial were a thing then. I expect Mama put up the tree as week or so before Christmas, but I do know it came down New Year's Day. We would un-decorate it while watching the Rose Parade. A couple years after hubby and I married my sister & her hubby gave us the silver aluminum tree that they had and that they'd gotten used from his brother. We used that tree for many, many years -- and to this day I still think it made the prettiest tree. We did NOT use a color wheel, and of course could not use lights, but we decorated with what I have always called 'special' ornaments -- figurines, wooden, ones the kids made, Hallmark or other ornaments. The ONLY colored balls were placed toward the inside of the tree to sorta hide the pole, and that didn't take many. Although we haven't used the silver tree in years now, I refuse to get rid of it. We now use a green artificial tree and I don't particularly like it. A perfect tree would be one where someone else put on the lights. I wasn't good at that. As a child just the endless excitement as daddy tucked us into bed...we never had much...but it was so much fun! As an adult, husband, kids, and I for many years visited tree farms and cut our perfect tree for that year..always a Douglas fir, always big and bushy. Added to that we’re our mini advent events after dinner, baking 300 dozen cookies ( you read that right 300!) and always the hanging of the decorations that were handmade in school by kids as well as going through memories of other ornaments given to us by friends or inherited. Later as kids grew and left home, I began building a village...it’s been packed in storage during the time the two of us moved to England for twelve years for my work. Now I’m back...lol! A special tradition developed out of grief after our youngest was brutally killed by drunk drivers...we now gather for at least one evening before Christmas to join hands and the tallest reaches up to hang Russell’s special ornament. Then we remember good times and enjoy the time we have now. Each of us has special ornaments...just little personalised brass angels that we have hung for years...every year the children’s (and the grandchildren, and great grands) get hung higher and higher as they grow...until you become older like me...at 71, I can’t reach as high as I used too... fact..the first one I bought was 39 cents.. they are now going at about $6! Thank you all for entering. 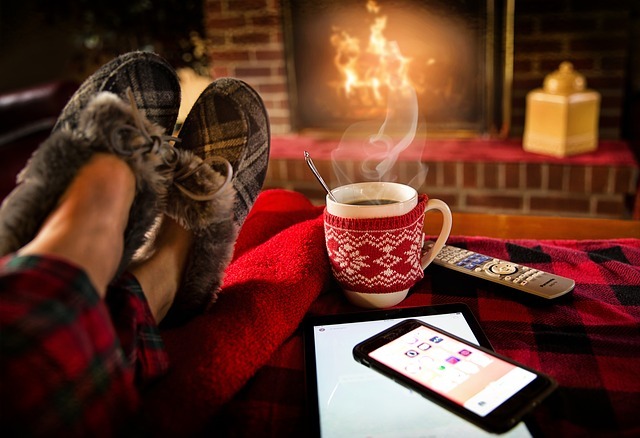 I truly enjoyed reading your stories about Christmas trees and traditions. I've chosen and emailed the winners!